Now, you people talking about getting the Holy Ghost and how you have to wait so long, here you are. Until God receives that sacrifice, until it's laid on His judgments there, until His judgment has actually killed your senses! You might say, “Well, I'm going to turn a new page.” That ain't it. “Well, I know I used to smoke, I'm going to quit smoking.” That still isn't it. 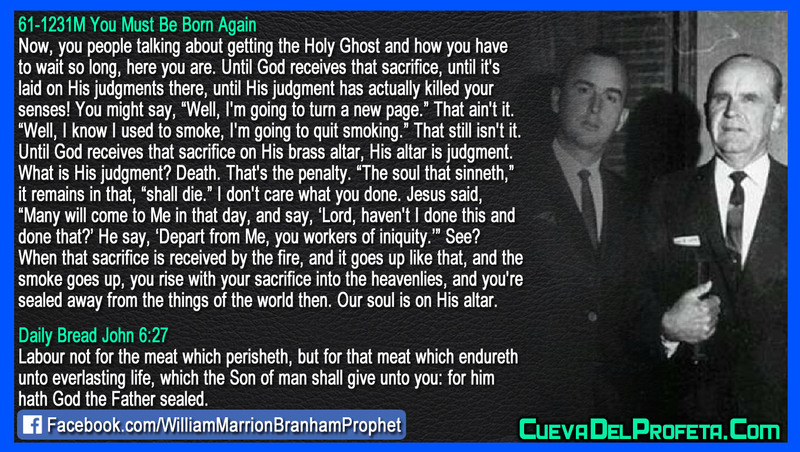 Until God receives that sacrifice on His brass altar, His altar is judgment. What is His judgment? Death. That's the penalty. “The soul that sinneth,” it remains in that, “shall die.” I don't care what you done. Jesus said, “Many will come to Me in that day, and say, ‘Lord, haven't I done this and done that?’ He say, ‘Depart from Me, you workers of iniquity.’” See? When that sacrifice is received by the fire, and it goes up like that, and the smoke goes up, you rise with your sacrifice into the heavenlies, and you're sealed away from the things of the world then. Our soul is on His altar.